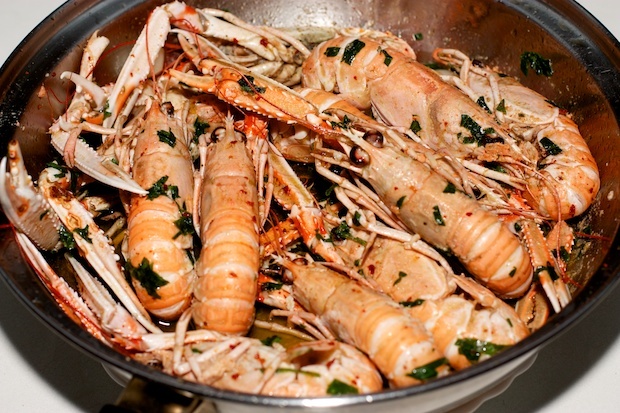 The island of Vis (in Dalmatia, Croatia) is famous for its shellfish. So during my trip there I asked the fishermen of the local fish market located in the harbor of Komiza if he could get me some scampi. The local restaurants were grabbing all the scampi up so they were not easy to find. After a few days of waiting, he came up with some. I’ve cooked them in the simplest way possible. In a small shop on the island of Vis, I had purchased a small bottle of “white vermouth” to cook the fish and for this recipe it was really useful. In a large pan put the olive oil, garlic, salt and chopped parsley. Place the scampi even after having cut with scissors along one side (to facilitate the removal of the pulp after cooked). Turn on high heat and add a little chili. When the oil begins to fry pour the vermouth and let it evaporate. Continue cooking for 8 minutes, turning the prawns at least once. Eating scampi means you’re not afraid to get your hands dirty. In fact, the hands should be used to eat them. If you are fresh, the head like the claws should be sucked, so you can savor the best of this crustacean.